The Sims 4 has had a fair few "packs" of venues, objects, and activities, but only one expansion pack: Get to Work. 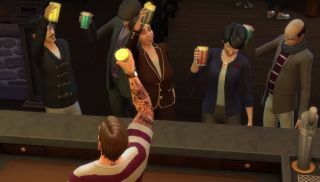 At Gamescom, EA announced a second expansion pack called "Get Together", one that focuses on social activities like parties, shopping, and—of course—WooHoo. There are hints of a new place for Sims to explore, which can't come soon enough given how tiny The Sims 4 feels compared to its predecessor, but the focus is on new activities. We see Sims swimming in a river, playing Foosball, trying on clothes for their friends... or using those changing rooms for a quickie. Synchronised dance routines and DJing hopefully represent new skills, if not whole new career paths, but we'll have to wait and see. Get Together is due for release in November of this year. I seriously hope they feel like they have to stick with this naming convention for the rest of The Sims 4's lifespan. Get Pets? For weather: Get Wet? Get in the Sea?